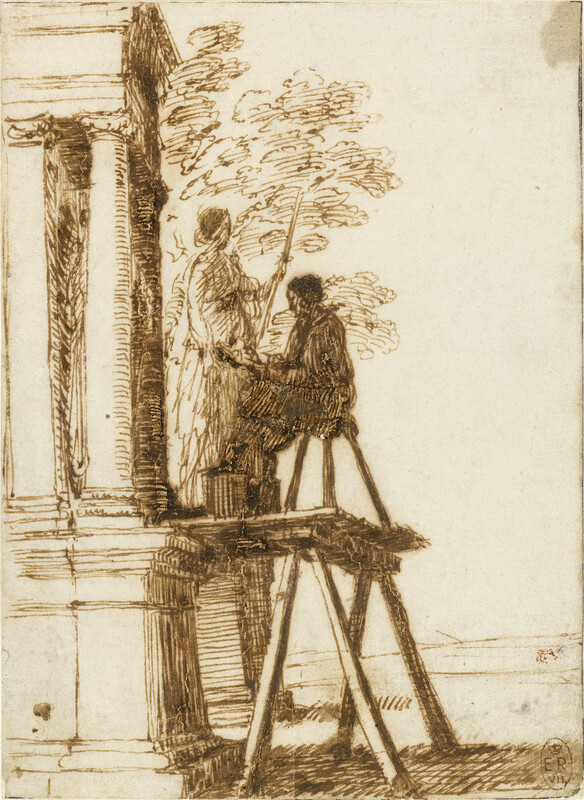 A drawing of an artist seated on a platform in front of a portico, drawing a statue. This is one of a series of 38 small sheets from a pocketbook compiled by Claude, now divided between Windsor, the British Museum and elsewhere. All depict scenes in and around Rome, and their spontaneity strongly suggests that Claude drew them on the spot. Here he depicts what must have been a common sight in Rome: an artist seated on a scaffold comprised of boards resting on a trestle, to raise him to the level of a statue so that he can make an accurate drawing without foreshortening. The artist is not drawing the statue that we see in full, which stands on a pedestal beyond him, but another that is almost hidden from view between the columns of a free-standing aedicule – just a few folds of drapery are visible. No such aedicule housing a single full-size statue is known from ancient Rome, and thus (if the image is not invented) it is probable that Claude witnessed the scene in a ‘sculpture garden’, such as those at the Villas Medici, Borghese and Ludovisi, with a modern aedicule constructed to house a treasured ancient sculpture. Although artists commonly drew ancient statues as a means of practising figures, Claude himself does not appear to have made many such studies. Drawing from Antique sculpture became part of the standard training of artists during the Renaissance, and in the seventeenth and eighteenth centuries this practice became something of an industry in Rome, primarily to serve the demands of antiquarian collectors from across Europe. The Royal Collection holds, for example, the bulk of the surviving ‘Paper Museum’ of Cassiano dal Pozzo (1588–1657), which includes more than a thousand drawings after Roman sarcophagi, statues, busts and other sculpture, commissioned from a team of draughtsmen, some of whom may have spent their entire careers producing such record drawings.